As most of you know (those that actually read our letters), last year we started a family biker gang. But about 20 minutes into Bike Week down in Daytona Beach, we realized that we probably aren’t the biker gang type. Maybe it was our accents, maybe our clothes, or maybe it was because we were the only bikers driving a car. Either way, we didn’t belong. It was like when you go to the store, try on a hat, and look at yourself in the mirror and you realize “I’m just not a hat person.” Only in our case, the “hat” wasn’t a hat at all, but a helmet. Deep down, we know that we’re still a type of gang. But, if we’re not a biker gang, what type of gang are we? Well, in order to answer this question we each took a quiz on Facebook that answered the question “Which famous ‘Happy Days’ character are you?” and we think that gave us a start. Lonnie got “Potsie” and Sara got, as you probably guessed, “Arthur Cunningham”. With both of these characters being pivotal figures in the founding of Rap music and the Hip-Hop lifestyle (at least according to Wikipedia), we realized “we’re not the biker gang type, we’re the Hip-Hop type”. could so that she could start writing her own songs. But because Lonnie insisted that she only buy the “edited” versions of these songs rather than the “explicit” versions, Sara didn’t realize that certain words had been omitted due to content. She thought they were only blank spaces. For a few weeks, she thought that Rap music was just a series of sentence fragments and unfinished thoughts. Then she was horrified. 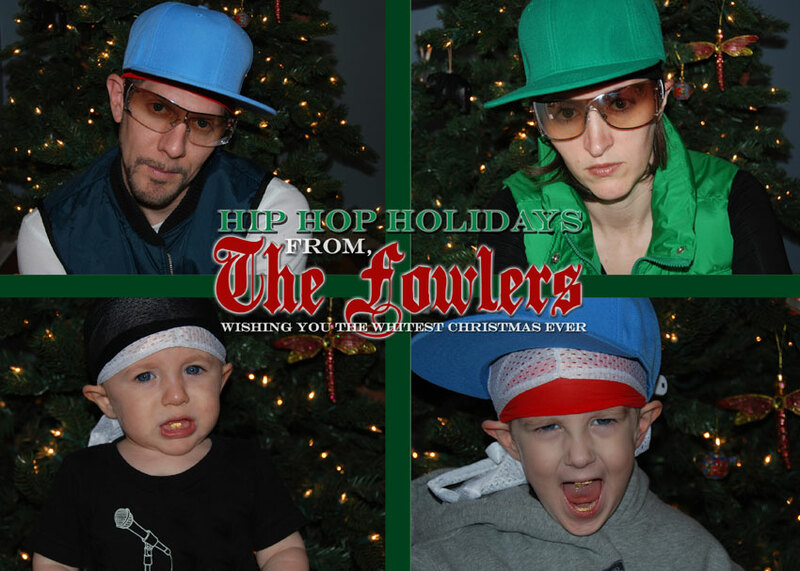 Now she writes Rap songs under the moniker Que-SaRa about the hardships of motherhood and has the FCC (Fowler Censorship Committee - also known as Lonnie) bleep out words so she sounds legit. But “what about our darling children?” you might ask. C-Note (Coyle’s new nickname) is excited about his new turntable and his low-rider big wheel and has been turning heads everywhere we go with his new “grill” of gold teeth. He’s more than happy to tell everyone that his little brother Shorty (Miles) just got his first two gold teeth. They grow up so fast, don’t they? Many of you might be worried about us spending so much money on our children’s toothy bling. What about their college fund or more importantly, the hot tub Sara wants to put in? You can all rest easy because it didn’t cost us a cent. We just melted down our wedding rings. We’re not as stupid as some of you give us credit for. Be on the lookout for Sara’s latest single “Bleep on My Hands”, the only Rap written about a diaper change. For realz. LISTEN TO SARA'S RAP, "BLEEP ON MY HANDS"
Listen to "Bleep On My Hands"
• The idea for 2010's letter started with us kicking around the idea of Sara being a rapper after having seen some more "urban" looking outfits for sale at the Nashville Flea Market. Lonnie spit out the chorus (at least, most of it) to "Bleep On My Hands". We then decided that rapping was the way to go and that we needed to finish writing and produce the song "Bleep On My Hands". • We bought all of our "wardrobe" for 2010 at the Nashville Bicentennial Flea Market. 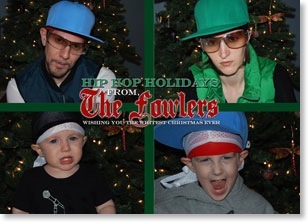 We got a great deal on our do-rags. • Miles' and Coyle's gold teeth didn't come out as well in the actual print of the photo. However, those grills look great in the online version.